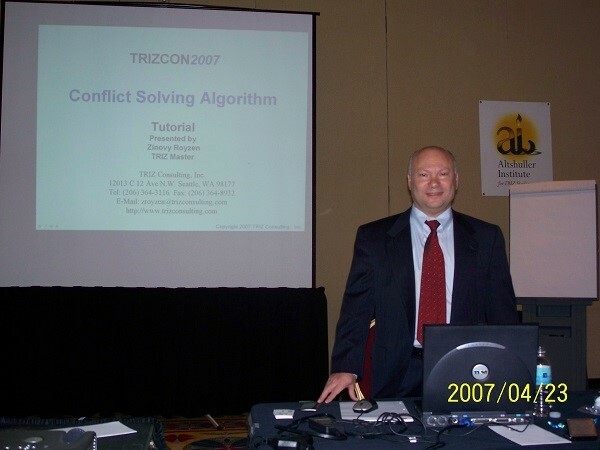 TRIZCON2016, Keynote Speech, New Orleans, LA, March 3-5, 2016, "TOP-TRIZ, Method for Innovation, Applications, Implementation"
TRIZCON2016, Tutorial "Breakthrough Innovation by Conflict Solving"
TRIZCON2016, Paper, Larry Smith and Zinovy Royzen, "Root Cause Analysis Using TRIZ"
23rd Canadian Congress of Applied Mechanics, Vancouver, BC, Canada, 2011, Tutorial "TRIZ - the Ultimate Tool for Problem Solving in Innovation"
TRIZCON2010, Altshuiller Institute for TRIZ Studies, Advanced Tutorial "Conflict Solving Using TOP-TRIZ"
TRIZCON2009, Altshuiller Institute for TRIZ Studies, "TRIZ Tutorial for Beginners"
TRIZ Future Conference, Keynote Speech, Netherlands, November 5-7, 2008 Key Notes "TOP-TRIZ: Theory, Applications, Training and Integration"
Iberoamerican Innovation Congress, Keynote Speech, Mexico, Oct. 8-10, 2008 "Winning Innovation Using TOP TRIZ"
Iberoamerican Innovation Congress, Tutorial, Mexico, Oct. 8-10, 2008 "Using of TRIZ in Industrial Application Cases. Solving Conflicts Using TOP-TRIZ"
TRIZCON2008, Altshuiller Institute for TRIZ Studies, Tutorial "Solving Problems Using TOP-TRIZ"
TRIZCON2007, Altshuiller Institute for TRIZ Studies, Advanced Tutorial "Conflict Solving Algorithm"
TRIZCON2006, Altshuiller Institute for TRIZ Studies, Advanced Tutorial "Conflict Solving Algorithm"
TRIZCON2005, Altshuiller Institute for TRIZ Studies, Advanced Tutorial "Revealing Causes of Failure Using TRIZ"
TRIZCON2004, Altshuiller Institute for TRIZ Studies, Advanced Tutorial "Maximizing Utilization of New Solutions and Super Effects"
TRIZCON2002, Altshuiller Institute for TRIZ Studies, April 28-30, 2002, St. Louis, Tutorial "Conflict Solving Algorithm"
TRIZCON2001, Altshuiller Institute for TRIZ Studies, March 25- 27, 2001, Canoga Park, CA, Tutorial "Algorithm for Inventive Problem Solving"
WESCON 2000, September 19-21, 2000, Anaheim, California.Short Course "Designing and Manufacturing Better Products Faster Using the Theory of Inventive Problem Solving"
ASME 2000 International Design Engineering Technical Conferences, September 10 - 13, 2000, Baltimore, Maryland, Tutorial "Designing and Manufacturing Better Products Faster Using the Theory of Inventive Problem Solving (Overview)"
TRIZCON2000, Altshuiller Institute for TRIZ Studies, April 30 - May 2, 2000, Tutorial "Standard Approaches to Solving Problems"
TRIZCON2000, Altshuiller Institute for TRIZ Studies, April 30 - May 2, 2000, "Revealing the Causes of Failure Using TRIZ"
TRIZCON99, First Symposium on TRIZ Methodology and Application, Altshuiller Institute for TRIZ Studies, March 7-9, 1999, "Ideality of Products and Contradictions"
TRIZCON99, First Symposium on TRIZ Methodology and Application, Altshuiller Institute for TRIZ Studies, March 7-9, 1999, Tutorial "Tool-Object-Product (TOP) Function Analysis"
The 18th Digital Avionics Systems Conference, October 24, 1999, St. Louis, Missuri. 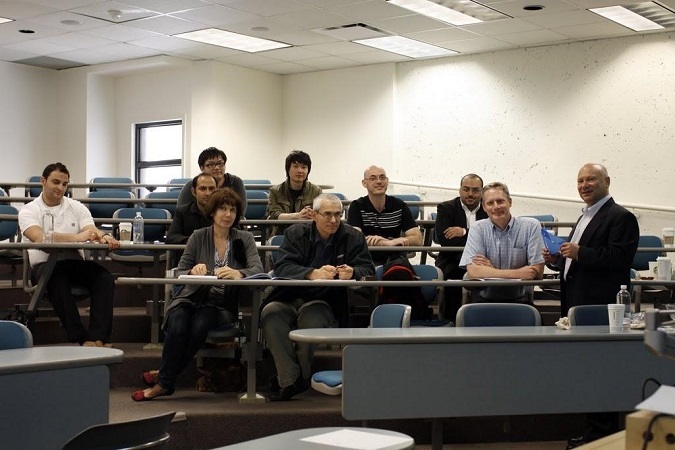 Tutorial "Theory of Inventive Problem Solving Fundamentals." Europian TRIZ Congress, Vienna, Austria, January 21,1999. 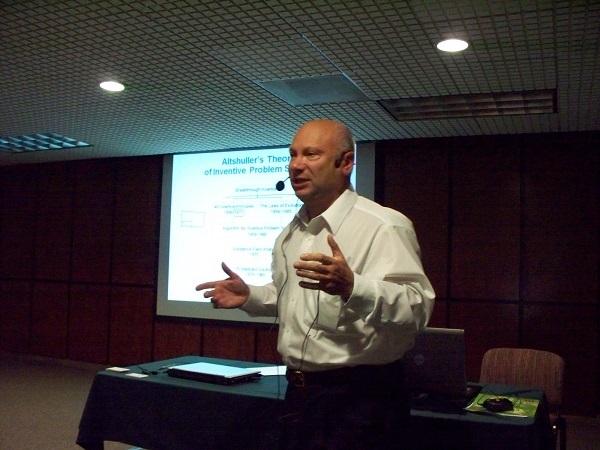 "Ideality of Product, Substance-Field Analysis, Case Studies." 1998 ASME Design Engineering Technical Conferences, September 13-16, 1998, Atlanta, Georgia. 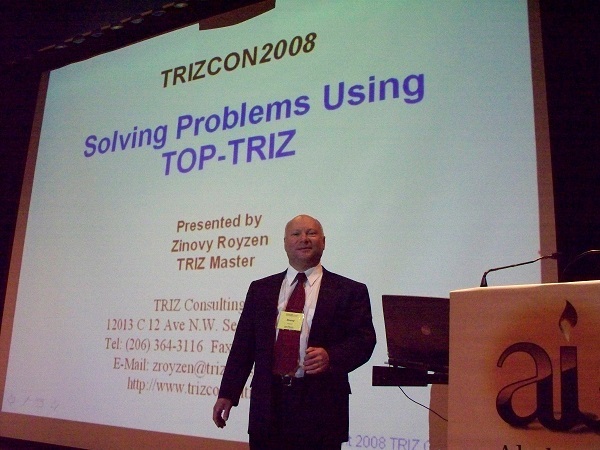 Four hour tutorial "The Theory of Inventive Problem Solving (TRIZ) Fundamentals" on September 13, 1998. The International Conference on Air, Space and Ground Vehicle Electronic Systems, 31 October - 6 November, 1998, Bellevue, WA. 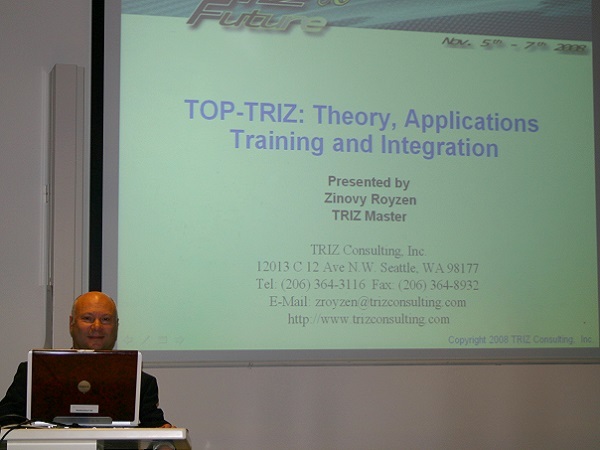 "Overview of TRIZ Technology for Innovation." The Tenth Symposium on Quality Function Deployment, June 14-16, 1998, Novi, Michigan. 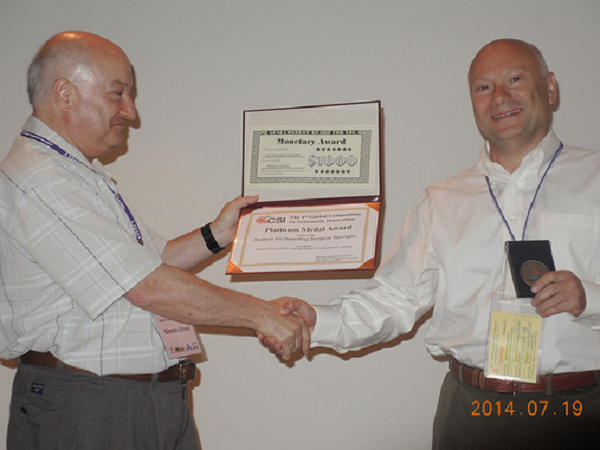 "Case Study: TRIZ Solves A Hard Drive Reliability Problem." Second ASI Total Product Development Symposium, Pomona, CA, November 1996. 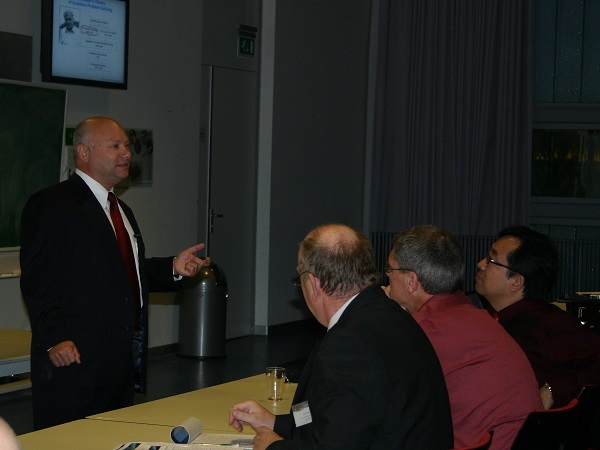 "Solving Contradictions In Development Of New Generation Products Using TRZ." ASI Total Product Development Symposium, Dearborn, MI, November 1995. "Product Improvement And Development Of New Generation Products Using TRIZ"
International Conference of Society of American Value Engineers, Fort Lauderdale, FL 1993. 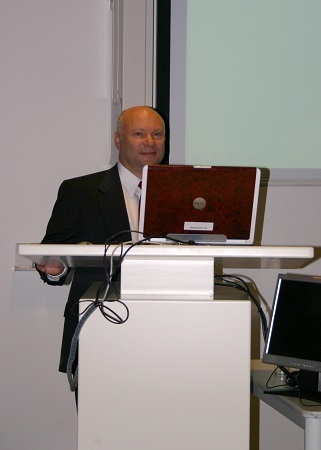 "Application TRIZ In Value Management And Quality Improvement." Copyright ©	2017 TRIZ Consulting, Inc. All rights reserved.